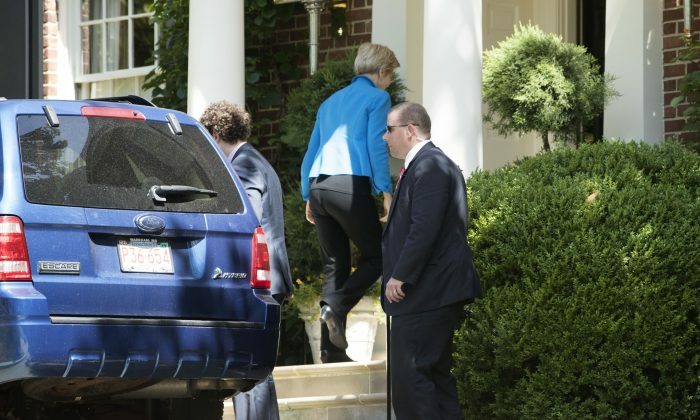 Presumptive Democratic nominee Hillary Clinton met with Massachusetts Senator Elizabeth Warren in Clinton’s D.C. home following the Senator’s full-throated endorsement of Clinton and denouncement of Donald Trump. “I’m ready to get in this fight and work my heart out for Hillary Clinton to become the next president of the United States and to make sure that Donald Trump never gets anyplace close to the White House,” Warren told MSNBC’s Rachel Maddow. The endorsement and meeting further fuels speculation that Clinton will tap Warren as her running mate. Warren has been one of the strongest attackers of Trump, using social media for direct assaults on Trump’s character to argue against his candidacy. She capped off the speech, tying the policies from Speaker of the House Paul Ryan and Senate Majority Leader Mitch McConnell to Donald Trump’s behavior. “Trump isn’t a different kind of candidate. He’s a Mitch McConnell kind of candidate,” she said referring to McConnell tepid endorsement of Trump. Warren is a popular liberal firebrand—with a populist appeal not unlike Bernie Sanders—and Clinton tapping Warren would help unite the two factions of the Democratic party that emerged over the course of the primary. Donald Trump weighed in, calling Warren “Pocahontas,” “Goofy,” and said that he hopes that she’s picked for V.P.